Here’s a fun new take on the traditional wedding guest book that will get wedding guests warmed up while the bride and groom discover just how well they really know their friends. It’s easy for guests to play; they just pick a page, write their message with a clue, then add their name to the back of the book. The newlyweds can enjoy reading the message and try to guess the guest who left it (don’t worry, they can always check the answers if they get stuck!) A cute little bookmark has simple instructions so that each guest knows just what to do. Designed by the wedding book whizzes at Illustries, Guest Who? is guest book with real personality, a fun ice-breaker and makes the perfect light-hearted gift too. free delivery until 31st May. 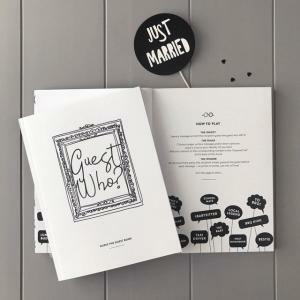 The book has room for 100 guests or couples and is professionally bound with a soft cover and matt uncoated paper pages for that top-quality feel. All Illustries books are designed, printed and bound in the UK. The book measures 180 x 235mm. Illustries was created in 2010 by Emma Penrice, a writer, and Samantha Smith, an artist and designer. Together Emma and Sam combined years of experience working with some of Britain’s biggest brands and international clients to create a range of unique, quirky, fun and stylish books. The Illustries range includes wedding albums, guest books, memory books, journals and planners for sharing life’s best moments. Illustries’ contemporary, simple, quirky and fun books are designed to capture the milestones and memories of life in style and with ease. Beautiful, practical and useful, every book in the growing range started life as a solution to a problem.